January | 2012 | The Everyday Entertainment of A Wife, Mommy, Friend & Weirdee!! Read All Your Favorite Blogs in One Place. You know, I believe you can find revelations in the smallest things…and people. Watching my children, Sanai (3 1/2), Jewel & Jowell (18 months), so much is revealed about the directions in which they’re headed. I see they’re all musically gifted at their young age, as their father and I were. Sanai sings more than half of the day…everyday. And she’s good…no…awesome at it too! I mean, the girl can really hold a proper note & sustain the right keys in songs, making it very easy to know what she’s singing if you already know the song and be able to learn it if you don’t. Jewel, my baby girl, not even 2 years old yet, also displays her love for exercising the melodies in a song. Her vocabulary is growing I see! You know how I know? I actually begin singing along because I know what song she’s singing! Go Jewel!! The most adorable thing is when both sisters are singing at the same time. Jewel, mimicking her big sis. Music to mommy and daddy’s ears:)! Jowell, my only son and Jewel’s twin brother, has already continued the family way of musicianship. Which way he’ll end up is the debate amongst some lol, but for now, he’s definitely a drummer…like his uncle. His dad plays the bass guitar. But even he started out on drums, then keys and bass. So as I said before, who knows what lil Jowell will end up taking to permanently. My girls also respond, very well I might add, to the rhythms of music through swaying & shaking (sometimes too much lol) . Aka…dancing. Maaaaaan, and do they MOVE! No matter the speed or volume, if they hear it, they’re moving. Sanai, the more coordinated & skilled of the two, dances as if she’d already rehearsed for the song and it’s now “showtime”. Jewel, the mimic, watches big sis intensely while copying & releasing quite a few of her own. They soooo remind me of myself, coming up. Jowell leaves the dancing to the girls but provides drumming and percussion lol. Sanai is a quick learner and shows she actually likes learning! I don’t know many kids that get excited about school work. I said I…maybe YOU do. Sanai, only 2 almost 3 years older than the twins, has already established herself as THE BOSS. I see she’s caught on that her siblings are now understanding more than they can actually say. So she doesn’t cut them any breaks. Oh, but let mommy or daddy reprimand them through strong tones and it’s,”they’re only baaaaabieeees!”. I could keep going but, I just wanted to let you in on a FEW things and what it all reveals to me. And that is, I birthed future singers, musicians, dancers, teachers, and leaders… the best at what they do because they practice! It reveals to me that my children are DESTINED for GREATNESS!! Speaking Life to Your Spouse. The first wake up*winky wink* was to the fumbling of my husband, John, preparing for work. He truly has been THEE ABSOLUTE BEST first person I see after waking up in the morning. Of course my children were my second wake up call. We all slept an hour longer than the norm. It was SUCH a busy weekend for all of us! They, of course, woke with energy in amazing abundance that won’t let up until they begin to see the sandman lol. Still, in all, it’s L.O.V.E. I’m ever appreciative and so thankful to God for these wonderful people. All of that being said, hello…GOOD morning! So I’m sitting in my living room chair looking all around me. My husband’s a bit under the weather so he’s home today. I’m sort of happy about that. He deserves a three day weekend…just not a sick one:(. My daughter is quoting lines from a movie she’s only seen all of three times…but in between last night & now. The twins are in the kitchen, in their high chairs, eating, banging,& moaning (yes, moaning…my lil weirdees). Coughs, sneezes, and runny noses are taking precedence in the midst of all of this LOVE around me:). It’s a rainy, let’s-lay-around-and-watch-movies-all-day, kind of day. I can dig it. Well I could. If I could. But I can’t. See, being that I’m a stay at home wife/mommy , until next month, I have an issue with just sitting/laying around. I can’t and won’t do that. I can’t because I have three extremely active toddlers always looking to “explore”. Not to mention they’re home schooled (with emphasis on my almost 4yr old). I also can’t because with toddlers around, there are always things to pick up, wipe up or down, and just clean altogether. Oh, and I like the house clean when my BIG baby gets home *winky wink*. Now, why I won’t. Well, I’m not lazy for one. Nor am I sick or disabled. While hubby goes to work to provide for our family, I am to be home…providing for our family. Some may call that being old school. I call it teamwork. I mean, holding down the fort while my help meet’s away is a part of our partnership. Whether I’m up super early or lag behind in time, the job gets done. Rain or shine. Ohhhh but when I’m done…and the babes are sound asleep…THEN…THEN is MY time! Time to watch a movie for grownups, write, blog *winky wink*, or just reflect. Sometimes I get to do that during the kids’ nap time. So my time also comes. Rain or shine. Next month begins a new job for me. I’ll be back on the clock after almost 3yrs too long lol. I’m excited about that. I’ll tell more about that later. I wonder how the jobs at home will pan out then *smile*. Should be interesting. But they’ll definitely get done. Welp, my little ones are up & at it! All with colds (that could’ve been avoided) & one teething something major…MOLARS!! What she means is for mommy to work her “magic” & make a home made steam bowl for her to breathe in to open up her nasal passages, making breathing more pleasant versus her impacted snot tunnel lol. Her little sister, who I featured in the debut of my blog, is currently showing off her acrobatic skills. Using mommy as her mat & swing. The poor baby’s doing everything but pulling her hair out behind these mean, aggravating teeth taking complete control of her mouth & mind. She even has a “stand up policy”. Yep. That’s right. No sitting allowed. You MUST stand while holding me & no, you may NOT lean against a chair for support when your legs begin to buckle & give way! May I add, my Jewel is the….”heavier” twin. I’m so in love w/the dramatics of BOTH my girls. I won’t down play it though cause I’m sure I wouldn’t want to trade places with EITHER of them. I can be real and acknowledge the FACT that most of their dramatics were inherited from…*long heavily drawn out sigh* …YOURS TRULY. I’m such the baby & truly not the easiest to deal with when not my healthiest. While allllll of this takes place, “my peace” sits quietly & ever so calmly by. My breath of fresh, cool air. I stroke his hair to let him know that in all of this, he is definitely NOT forgotten. He just smiles at me & procedes to his busy task…whatever that may be. Beating his drumstick on whatever is in his path, throwing ANY given (or not) object down the stairs (both sets) to watch tumble to sometimes a crashing death. But hey, anything is better than tears or painful screaming so hit & toss away, my future musician/pro ball player! My babies need & depend on me. I can dig that. I’m quite familiar with the feeling. I too had a mommy (r.i.p. my love) & now get to enjoy the everyday entertainment of the joys & sometimes pain (in the legs) of the GIFT of motherhood. I am honored & blessed! Well, here I am…wide awake at 1:59 am. One of my 18 month old teething like 4 teeth at once, whiny, fussy, angry babies in my arms. Yes, I did say “one of”. I have three toddlers (one turning 4 in less than two weeks & 18 month old boy/girl twins). I’m holding, rocking, & pacing the living room floor…PRAYING her back to sleep…in my mind. I PRAY it works…ASAP…in Jesus’ name…*looks up*. 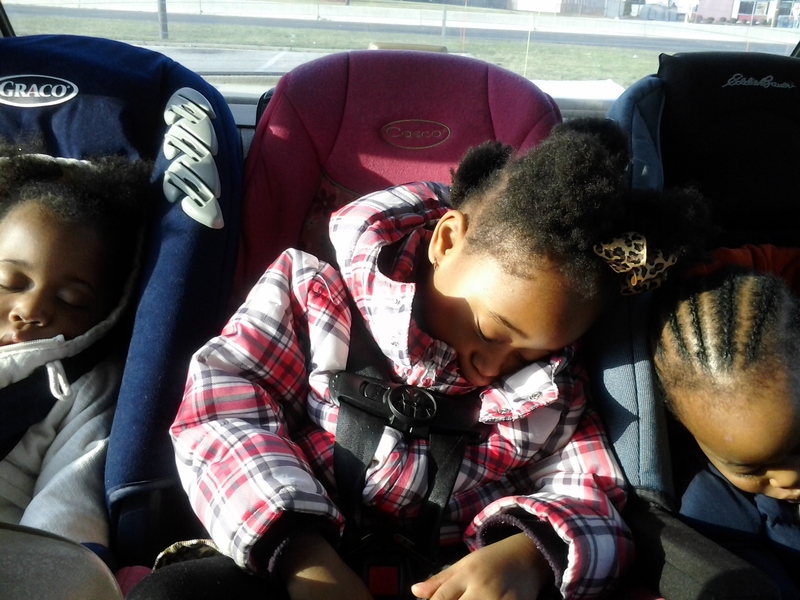 Meanwhile, hubby (John), toddler #1(Sanai), & twin b (Jowell aka Jojo) are S.O.U.N.D. asleep. Umm, literally. Sounds of snoring. Different yet consistent varieties. Not too shy of a twisted breathing symphony. *looks up again*. Okay, my lap baby (in this case, arm) is now a limp 20lb+ weight. *looks up yet again*, thank YOU Father!! *sigh* So, I’m new to blogging. Well, actually WRITING a blog. Please excuse my “style” of writing. I feel most at “home” writing the way it naturally comes out. So, if you’re an English major or PROFESSIONAL journalist…you may find yourself raising an eyebrow…sometimes two LOL. I’m not “grammatically challenged”…just “stonetically unique”! Lol. I suppose I’ll take this time to introduce my self…. HELLO! My name is Jamelia but I very seldom ever hear myself referenced as that. You’d probably be more likely to hear “Stoni”…like Jada Pinkett-Smith’s character in one of my favorite movies, “Set It Off”. That’s actually EXACTLY where I acquired the nickname. So if you’re still wondering where I came up with “stonetically unique”, THERE YOU GO! You know, I find myself ever the more amazed at how far technology has come. I’m blogging from my cell phone! My FREAKIN’ CELL PHONE!!! Oop! Which is currently losing battery life rapidly, so I’d better get that good ol’ charger before I end up dreaming of throwing my phone in the lake of fire. I know, why get mad at the phone…it can’t charge itself. Yeah, I know. So what*shrug*. Hmmmmm…*tapping chin*…okay, so…yeah, WHO AM I? I am a woman believing, standing, & walking(sometimes running & tripping) in the christian faith. I am married (5yrs this past December) to one of the most humble gifted & coolest brothers I’ve EVER encountered in my 30yrs of living. You already know I have three children…oh! I have a rather large family (counting the in-laws) & a few…literally like three consistent…close friends. Only one being my best. I enjoy writing…anything my mind conjures up and singing…anything my heart feels melody worthy. I live for quality time spent with my husband and children. Those guys are HILARIOUS and I’d NEVER trade the wholesome, meaningful feeling they add to my being. Okay, it’s now 2:44am and my eyes are heavy and on fire, yet I’m feeling a strong urge to “go in” on this bloggy thingy. I’m just gonna continue tomorrow…whenever I get a vacant moment. This feels right. Fun. I’m down. Join my walk (sometimes run & trip) through my everyday entertaining life.